Great MP3 gift for her. Just in time for Valentine’s Day, a gorgeous new pink iPod nano joins the lineup of the world’s most popular music player. 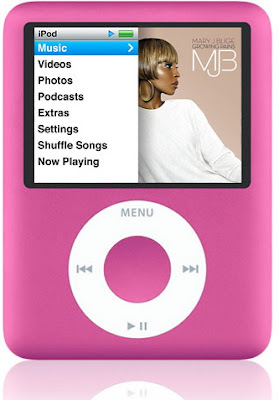 The much-requested pink iPod nano features a stunning two-inch display for watching music videos, TV shows, or movies rented using the brand new iTunes Movie Rentals. Available immediately in an 8GB model , the pink iPod nano can play up to 24 hours of audio or 5 hours of video on a single charge. In addition to pink, 8GB iPod nano models also come in silver, black, blue, green and a RED special edition. [Jan 22, 2008] Available now iPods for Sale Fill it with Fiona Apple, Pink Floyd, Beastie Boys MP3, MJB or just love songs. She will love you forever. Intead of a mix tape call it a "Mix MP3" . It appears everything is going pink now a days.